Grundtvig, regarded as the founder of the folk high school, received inspiration for the concept from the English boarding schools, but Grundtvig's focus was not on formal education but on popular education. The idea was to give the peasantry and other people from the lower echelons of society a higher educational level through personal development; what Grundtvig called "the living word". The language and history of the fatherland, its constitution and main industries (farming) along with folk songs should be the guiding principles for an education based on a Christian framework. The first folk high school was established in 1844 in Rødding, Denmark. The school in Rødding, however, was somewhat aristocratic as chiefly civil servants and rich farmers were enrolled. Another pioneer for the folk high school was the teacher Christen Kold. His, for that time, highly unorthodox way of teaching gave the folk high schools a broader democratic basis in comparison to the initial religious focus. The teaching took place from November to March because students did farm work the rest of the year. Kold's goal was for students to return to the school regularly in the winter to continue their education. In the beginning only young men could attend the courses, but in 1861 young women also gained access to folk high schools when teaching began being offered from May to July. The men still only attended during winter. The breakthrough for the idea was the Second War of Schleswig in 1864 when Denmark had to surrender a large part of its territory. This incident allowed the growth of a new Danish consciousness and nationalism based on enlightenment of the people. Denmark's loss of territory to Prussia hit the Danish national consciousness hard, but there was a group of young men determined to benefit from the disastrous war, which became a catalyst for a new Danish identity. They established folk high schools all around the country and by 1867 twenty-one folk high schools had opened. Almost everyone working at the folk high schools had been an apprentice of Grundtvig. In 1918 the number of folk high schools in Denmark had reached 68. The modern folk high schools vary significantly. Some still have a religious focus but most of them are secular. The schools are still "Grundtvigian" folk high schools which means that their focus is on enlightenment, ethics, morality and democracy although they are not taught explicitly. The Grundtvigian philosophy is embedded in the teaching of various subjects, e.g. the arts, gymnastics, and journalism. Most of the schools have an area of expertise, for example sports, music, art or writing. Since no degree or diploma is awarded the teaching is freer and more informal than at ordinary educational institutions. Most Scandinavian folk high schools are boarding schools where the students live for 2–6 months., and some schools offer programs for an entire year. Grundtvig fought for a school with popular education as the primary focus. The folk high school movement was an act against a conservative ideal of both education and culture. An act against an ideal of literacy and book-learning, a use of language unknown to common people and a learning ideal where the primary relation was between the individual and the book alone. The movement therefore started as a row with the old school. Grundtvig fought for a public education as an alternative to the university elite. The folk high schools should be for those wanting to learn in general and to help people form part of human relations and society. The folk high schools have changed naturally – some also radically – through time, but many of Grundtvig's core ideas about the folk high school are still to be found in the way they are run today. The folk high school of today is engaged in a complex modern reality and influenced both by national, international and global questions. One of the main concepts still to be found at the folk high schools today is "lifelong learning". The schools should educate for life. They should shed light on basic questions surrounding life of people both as individuals and as members of society. To Grundtvig the ideal was to give the students a sense of a common best and focusing on life as it really is. Therefore, Grundtvig never set down guidelines for the future schools or a detailed description of how they should be run. He declared that the folk high schools should be arranged and developed according to life as it is and the schools should not hold exams because the education and enlightenment was a sufficient reward. The essential element was and is the life at the schools. A folk high school becomes what it is because of the individuals of which it is made. Learning happens across social positions and differences – the teacher learns from the student and vice versa in a living exchange and mutual teaching. For Grundtvig dialogue across differences was essential – the ideal was that people must learn to bear with the differences of each other before enlightenment can be realized. Especially in non-German speaking countries, the folk high schools may be boarding schools or may mainly offer courses for adults age 18–30. In addition to the Nordic countries and Germany there are also folk high schools in Switzerland, Austria, and France. The first folk high school was founded in Rødding, Denmark, in 1844. It began on the initiative of Christen Kold, who was a follower of Grundtvig. The school was inspired by the need to educate those not fortunate enough to have an education and the poor, or peasantry, who could not spare the time or the money to attend a university. Among the other old folk high schools in Denmark are Testrup Folk High School (founded 1866), Askov Højskole (founded 1865) and Ry Højskole (founded 1892) in Jutland; Vallekilde Folk High School in Zealand (founded 1865), and Rødkilde Højskole on Møn (founded 1866). The International People's College in Helsingør is unique among the Danish folk high schools in that it is the most international one in Denmark, with classes taught in English and teachers and students from countries all around the world attending. There are around 70 folk high schools in Denmark. The principal subjects of instruction vary from the creative arts such as music, arts, design, writing, to intellectual courses such as religion, philosophy, literature and psychology. Some schools even have courses that specialize in sports. Tuition varies, but is typically around 1300 Danish kroner per week, including board and lodging. In recent history, globalization has exercised an increasingly important influence on Danish schools. Many courses are open to foreigners as well as Danes, and many courses include travelling or voluntary stays in other countries as part of the curriculum. In 1889, Sofia Hagman started the first folk high school in Finland in Kangasala. Public, private, secular and religious folk high schools are common in Finland, and there are also worker's high schools, which are governed by the labor movement. There are 184 folk high schools in Finland, with an annual course attendance of 650,000, in 2 million hours of lessons, which are substantial numbers for a country of 5.5 million people. Unlike in Finnish public education, there are tuition fees, per-course and per-lesson fees. The most common subjects are handicraft skills, music, languages, physical education, visual arts, theater and dance. In 1866, during the Second Empire, Jean Macé founded the Ligue de l'enseignement ("Teaching League"), which was devoted to popular instruction. Following the split between the Anarchists and the Marxists at the 1872 Hague Congress, popular education remained an important part of the workers' movement, especially in the anarcho-syndicalist movement which set up, with Fernand Pelloutier, various Bourses du travail centres, where workers gathered and discussed politics and sciences. The Jules Ferry laws that were passed in the 1880s established free, secular, mandatory public education as one of the founding principles of the Third Republic. In addition, many teachers were strong supporters of Alfred Dreyfus during the Dreyfus Affair of the 1890s. 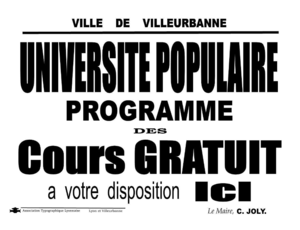 Afterward, some teachers set up free educational lectures on humanist topics in order to struggle against the spread of anti-semitism in France. In more recent times, following the 1981 presidential election Minister of Education Alain Savary supported Jean Lévi's initiative to create a public high school that would deliver the baccalauréat but would be organized on the principles of workers' self-management (or "autogestion"). This high school took the name Lycée autogéré de Paris (LAP). The LAP was explicitly inspired by the secondary school Vitruve, which opened in 1962 in the 20th arrondissement of Paris (and is still active), Oslo Experimental High School, which opened in 1967 in Norway, and Saint-Nazaire Experimental High School, which opened six months before the LAP. Theoretical influences include the works of Célestin Freinet, Raymond Fonvieille, Fernand Oury, and other theoreticians of the institutional pedagogy, institutional analysis (René Lourau in particular), and institutional psychotherapeutic movements. This type of folk high school is currently most widespread in Germany. Because they offer preparatory classes for school exams, in Germany these schools also function as the equivalent of adult high schools in other countries. 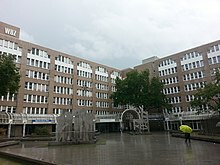 Germany also has folk high schools that are boarding schools, called Heimvolkshochschulen. The first folk high school in Norway, Sagatun, was founded in 1864. As of 2012, there were 77 folk high schools spread across the country, thirty of which were Christian schools. Folk high schools provide opportunities in general education, primarily for young adults. These schools are different from lower secondary schools, upper secondary schools, and higher education. All students are eligible for normal financial aid. Some folk high schools are connected to some sort of organization, but a large number of them are owned by a foundation and some are owned by the county. Most courses last for one year, but a few schools give a second year course. Common course options include outdoor skills, land use skills, the arts such as photography or painting, music such as jazz or rock, Norwegian language & culture, and travel skills. The first folk high schools in Sweden were established in 1868. The first school was open only to men, but already in 1870, the first folk high school for females was founded by Fredrique Paijkull. As of 2008, there are about 150 folk high schools throughout the country, most of which are situated in the countryside, often in remote areas. Tuition is free, and the students are eligible for normal financial aid for expenses such as accommodation and other school costs. After graduating, the students are eligible to study at a university. Some schools, for example Södra Vätterbygdens Folkhögskola near Jönköping, cooperate with schools in other countries and have an exchange student program. In 1998, the Grundtvig Movement of Nigeria led by Dr. Kachi Ozumba Snr. established Grundtvig International Secondary School, an independent co-educational secondary school built upon Grundtvig's principles for education. Americans John C. Campbell and Olive Dame helped create a folk high school in rural Appalachia based on observations of European folk high schools. The John C. Campbell Folk School opened in 1925 in Brasstown, North Carolina, and it is still offering classes today. Students can learn American traditional arts and crafts, including blacksmithing, ceramics, cooking, jewelry, dance and music. Myles Horton, who co-founded the civil rights-focused Highlander Folk School in New Market, Tennessee in 1932, was also inspired by the Danish folk high school movement, as can be read in his autobiography The Long Haul. ^ "The Danish Folk High School". Archived from the original on 2008-06-21. Retrieved 2009-06-24. ^ kfh@ffd.dk. "A brief history of the folk high school - Danishfolkhighschools.com". danishfolkhighschools.com. Retrieved 13 December 2017. ^ kfh@ffd.dk. "Daily life at the folk high schools - Danishfolkhighschools.com". www.hojskolerne.dk. Retrieved 13 December 2017. ^ "Official website of the LAP". Archived from the original on 2007-03-14. Retrieved 13 December 2017. ^ Paykull, släkt, urn:sbl:8076, Svenskt biografiskt lexikon (art av HG-m), hämtad 2014-01-17. ^ "Grundtvig International Secondary School -". grundtvigsecondary.com. Retrieved 13 December 2017. ^ "John C. Campbell Folk School". folkschool.org. Retrieved 13 December 2017. This page was last edited on 20 January 2019, at 07:54 (UTC).